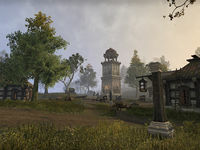 Vlastarus was a settlement located in the Greenmead region of Cyrodiil's West Weald, along the Gold Road east of Skingrad. During the Alliance War of 2E 582, Vlastarus was a bustling town. It was largely untouched by the war, attracting refugees from all over Cyrodiil. However, the town was threatened by an increase in the number of undead, Daedra, and bandits in the surrounding countryside, and the nearby ruins of Vlastarus Towers were occupied by a bandit gang known as the Gray Vipers led by a hag named Fegra. 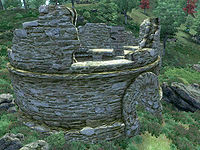 Vlastarus was initially located within the territory held by the Aldmeri Dominion, although the town and the nearby Castle Brindle changed hands many times over the course of the war. The Imperial Legion later built a fort at Vlastarus, but it was abandoned by the Legion during the relatively peaceful Third Era. By 3E 433, nothing remained of the town other than the vampire-infested ruins of Fort Vlastarus.